I had a long break from this blog due to completing my PhD. While I have been looking forward to getting back to writing here, it has been a little harder than I thought to find the motivation. 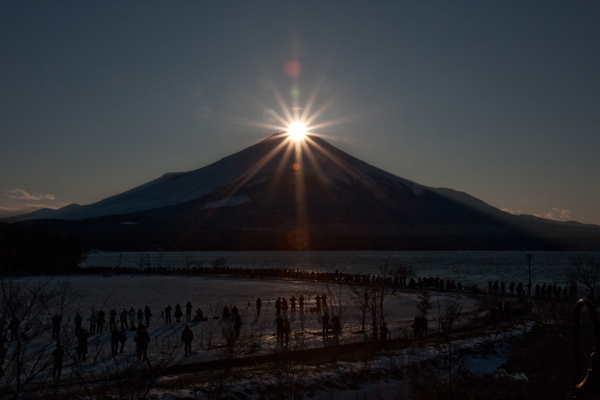 So I set a deadline to push myself back into the project and Valentine’s Day and the Diamond Fuji phenomena was the closest date and so here I am. I can't quiet believe it was two years ago that I first posted about Diamond Fuji. I love the internet, for all sorts of reasons, but today I love it because of live cams. Yamanashi Prefecture have a camera set up in Nagaike Park on Lake Yamanaka, which is marked with the A in the picture below. The picture above is also from that location. Thanks to that camera I was able to watch a Valentine's Day sunset and try my luck with seeing the diamond sun rays. Unfortunately I didn't see it, the camera loads up every two minutes and today that meant the moment before and the moment after. Although, as you can see from the still below that the sun is not quiet at the centre of the rim at the moment. This a quick video made from the live cam stills of the Valentine's Day sunset as I saw it on my computer in Sydney. I had to down-res it quiet a bit so its probably a mass of pixels and very abstract. umm doesn't want to load here so I have uploaded to youtube. 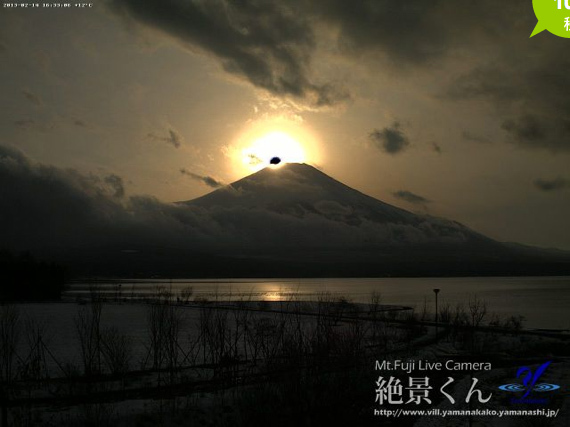 There is a nice Volcano Fuji moment after the sun goes below the rim. There weren't many photographer out today- perhaps because of the threat of clouds and it being a work day. I only spotted one or two people moving about. I am looking forward to watching again on Saturday to see the crowds and hope for good weather and timing. Let me know if you are watching too. I will be visiting all my regular blogs and commenting again. Here's to a productive, bright and sparkling 2013.
birdmonkey is Raquel Ormella, a Sydney and Canberra based artist.